A year ago, I decided I wanted to put on a conference. I had just started my PhD program at UBC and finished a course on the history of environmental thought. It became clear that there was so much to learn about our religious and spiritual relationship to the world. Being new in the Pacific Northwest I wanted to bring people together, to see what was out there, what was being done, and how we might form a stronger community of ‘spiritual ecologists’ in the region. I wanted to discuss religion, spirituality, ecology and cosmology in the same space, and I wanted to gather strength for the fight for our future that our generation is in the midst of. What started as an idea became a reality from September 22-24 and the 29th. With fifteen artists and at least twenty four presenters, speakers or narrators this truly was a Convergence of talent, ideas, passion and beauty. I chose the title Spiritual Ecologies and New Cosmologies, because I wanted to span the diverse terrain of scholarship, activism and advocacy for a new way of seeing ourselves in relationship to the earth and the Universe herself. I chose the plural because I knew there would not be just one vision of a sacred earth or a sacred cosmos, but many. I chose Convergence, because I wanted it to be about more than just presenting papers. As the core organizer I made plenty of mistakes: perhaps too many speakers, too few breaks, too much time in our heads. But overall we had an amazing spectrum of lectures, presentations, storytelling, performance, walking meditation, art and most importantly discussion and sharing. While the Convergence is over, the art will be exhibited at the Liu Institute until November 6, so if you missed the Convergence stop by! The picture of Monday’s speakers brings me great joy. For all the strife and religious violence in the world it was amazing to have people speaking from 10 different traditions, and sharing those perspectives with an audience of 80 other perspectives. We had some technical difficulties and the speakers went a little long, but to be in the First Nations Long House among the amazing totems and pillars was a wonderful place to tell stories of origin and beginnings. We were welcomed to the Musqueam territory by Elder Larry Grant, who told us about the origin of the name Musqueam, and the problematic nature of colonial English words like ‘creation’ and ‘Creator’ and the Musqueam concept of all things possessing a life force. As we learned, not all of our spiritual traditions tell stories of beginnings –our Buddhist and Hindu storytellers spoke of unimaginably long cosmic cycles within which human beings strive for liberation from suffering. While the Judeo-Christian creation stories (Gen. 1 and 2) offer poetic details about the emergence of the universe and a cast of characters, our Sikh storyteller declared that only God knows how the universe was brought into being. For us it will always be a mystery. In Islam, everything in creation points back to Allah, from beginning to end, and our Mormon storyteller spoke of our eternal co-existence with God and the universe. If we had had more time, I would have asked 10 more scientists to speak from their traditions. But our cosmology story teller, Ben Pfeiffer a Langara College science professor, did an amazing job, by telling of the Big Bang and the origin of the earth in a story that included a mythical spider who challenged the dominant telling of the scientific story of the universe by mostly white men. After the welcome dinner, we heard from those in the audience who brought up many interesting points and spoke from experience. They all had stories to tell, and I wish we would have had time to hear them all. On our second day, via skype, we heard from the producers of ‘Journey of the Universe’, a film about reconnecting the human purpose to cosmic evolution. During the response to the film by Bruce Sanguine, a local self-professed evolutionary Christian, a young woman entered the room and began speaking loudly, asking if she could speak, asking what we thought we were doing. I tried to ignore her and move on with the evening, but she persisted despite efforts by some of the participants to calm her down and invite her outside. At one point she insulted our speaker by saying what he was saying made no sense. As Bruce continued, I lost my temper and stormed up to her demanding that she leave the premises. She refused and my anger only escalated her outbursts. The room was tense and we tried to move forward, while someone called UBC security. While I stormed around, one of the participants quietly gained her trust, and took her outside, calming the woman down, and teaching her how to reconnect to herself through the ground and the trees that surround the Liu Institute. The woman admitted that perhaps she should not have made such a scene and apologized. The evening proceeded with some very insightful reflections, but as I reflected, my boldness melted into shame. Yes, I had worked so hard to build something, and she had tried to ruin it…How dare she insult my speaker! But I realized what a perfect metaphor it all was. All of our preconceived notions of comfort, order, harmony, normality, and mental health can be shattered in an instant. How could I change my relationship to the earth if I could not even love one person suffering from a momentary lapse in mental health? If that woman, who refused to tell us her name, is reading this, I want to say I am sorry. Please forgive my lack of compassion for you. I will do better. 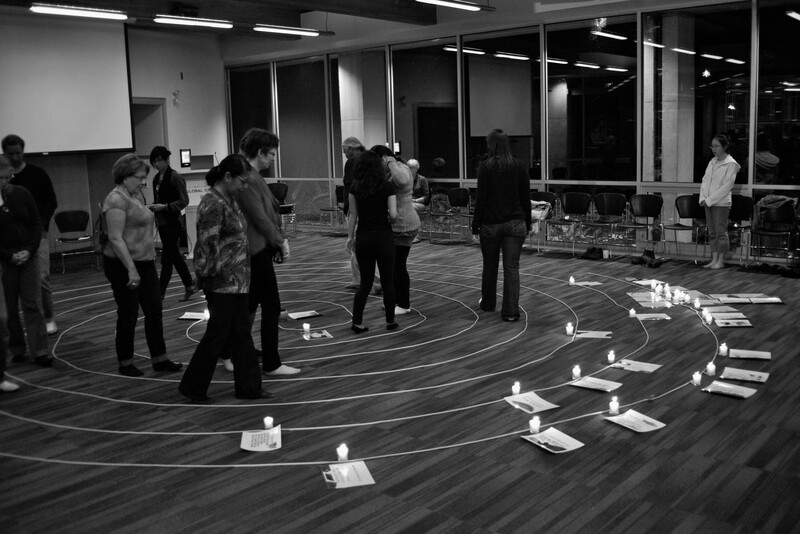 After our discussion we turned to the Sisters at Earth Literacies Program for a walking meditation that spanned the entire history of the universe as told by contemporary Cosmology, each milestone marked with a candle. I was impressed by the amount of silence between the beginning of the universe and the emergence of galaxies, and the tiny spaces between the creation of earth and the evolution of consciousness. After the Sisters outlined the journey, we all walked the spiral from the center to the outer edge in silence. It was profound to see the milestones that led to Jason M. Brown walking in a small room of peers in British Columbia under my feet; to grasp that I was but star stuff reflecting back on the process of becoming Mind stuff. On the third day we had an amazing and full lineup of speakers. We had some great discussion as well. I felt so privileged to be around people who care so deeply about the earth and making our civilization more sustainable. We also had the perspectives of Hindus, Buddhists, Christians, Jews, Pagans, Unitarians, Survivalists, Atheists and more! I was struck by Meg Robert’s and Mike Bell’s points about the importance of spiritual practice for keeping our activism vital. I was struck by the need to ground our consciousness raising in the landscape, in a context, or as Matthew Humphrey argued, in a bioregion, or life-place. As Franciscan Priest Richard Rohr has put it in his writing “We don’t think ourselves into new ways of living, we live ourselves into new ways of thinking.” This is exactly what Suresh Fernando is attempting to do with his spiritual community at Ruby Lake on the Sunshine Coast. Yes we can seek personal spirituality, but it must be grounded in place, in tradition, in community. With respect to system change we had a few different minds. For example, Winnie Chu is starting an air pollution monitoring company guided by Buddhist principles. Others were adamant that what is needed is to create semi-autonomous zones that can push back the system which is hopelessly corrupt, to birth a new way of living on earth. These autonomous zones would not just be political, but could demand freedom from noise pollution, light pollution, techno-addiction, and the alienation from life itself. In the end it seems that authentic Transition will require an all hands on deck strategy: system change from within and pressure from without. 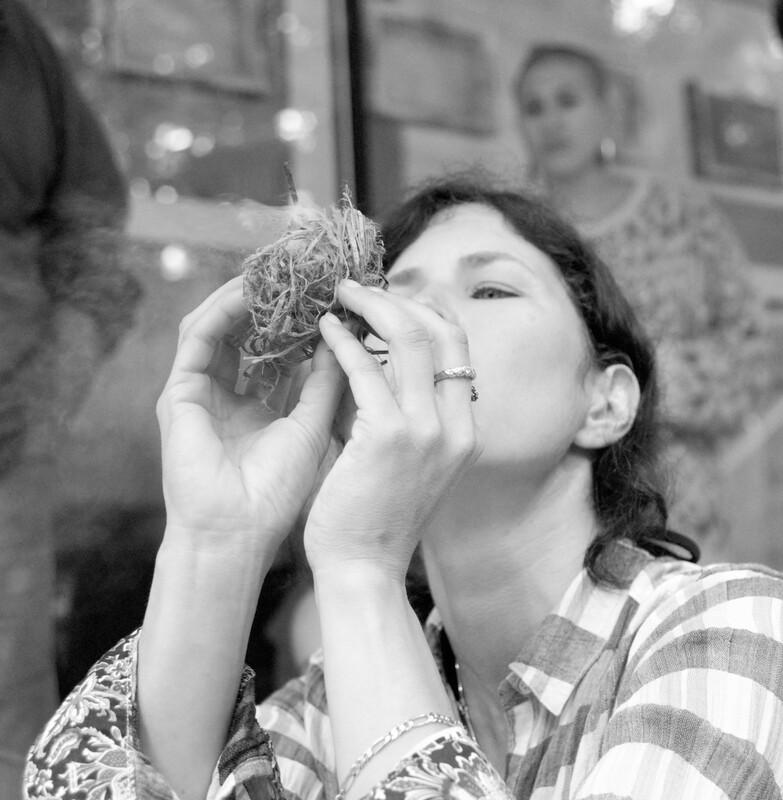 Spiritual practice is what will keep us grounded and keep us from burning out. We must be connected to the wild and to each other. And yet, it is essential that in seeking the wild, we do not romanticize it as some far off wilderness park. As Nikki Van Schyndel reminded us, our hearts are wild, and there are wild things all around us. And yes, sometimes it is scary, but fear can be the birth pang of joy. Yes, we must push back industrial civilization to some measure of sustainable limits, and yes we must protect and restore intact ecosystems; but we must also remember to dwell in the wilderness of the present moment, with what and who are all around us while we work toward these goals. 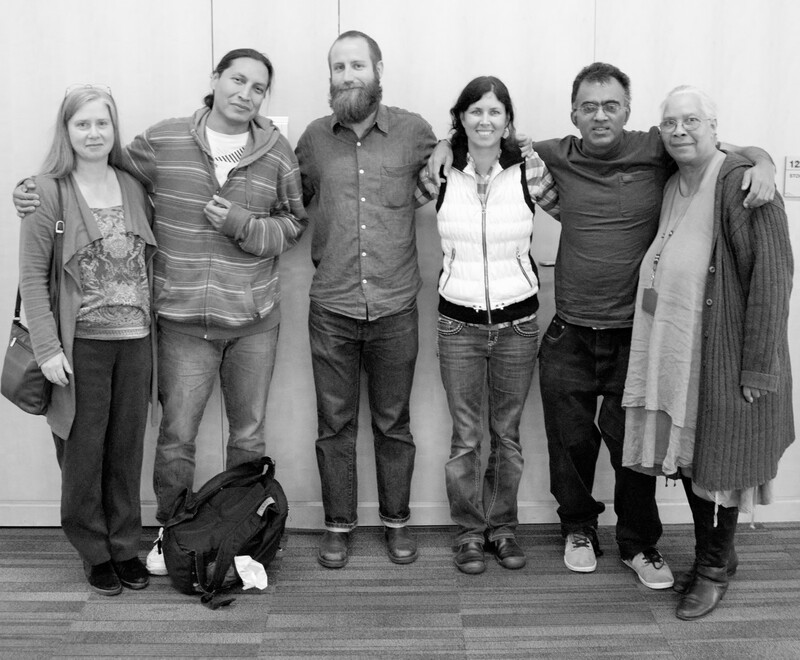 We were blessed to have several First Nation’s folks among us for our discussions, and they reminded us of the dangers of appropriating Indigenous lifeways. We must stand in solidarity with First Nations peoples and against continued racism; but we must also decolonize our own traditions and retrieve and reclaim the good and beautiful in them. As a Christian practicing Zen Buddhism, this was a particularly potent lesson for me. The Celtic and Franciscan traditions of Christianity have been neglected for the colonial, guilt ridden, and capitalist Christianity of the West. Nikki teaching us how to make fire with a bow drill. On Monday September 29, we decided to continue the community that was forged during these few days. The Spiritual Ecologies and New Cosmologies Community, a tentative title, has been born. 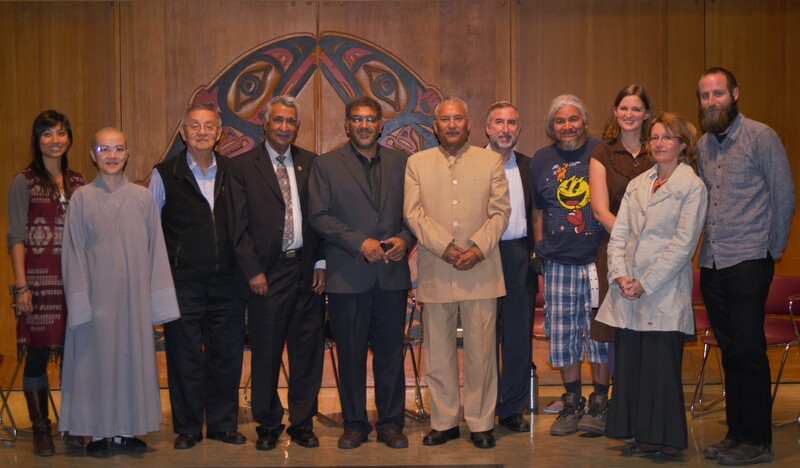 Starting with online networking and resource sharing we want to continue to build bridges and understanding between faiths, to offer resources to communities of faith in the Pacific Northwest that want to do more to connect their faith with the earth. The community wants to plan more events, a 2015 Convergence perhaps, but definitely smaller workshops on Sacred Activism. Ari Lazer, one of artists is also hosting a workshop on Sacred Geometry, so check that out. If you did not get the email I sent out and would like to stay connected please let me know. Thank you to all who attended this convergence! To my co-coordinator Elaine Hsiao, to Andrea Reynolds at the Liu Inistitue, to Blake Smith and Miriam Matejova from the Liu Lobby Gallery and to Maya Graves-Bacchus for her help and to many others for your love and support.